For classical music fans and scholars – and increasingly, for those devoted to other musical genres, including non-Western forms as well as jazz and popular music – the various editions of the Grove Dictionary of Music and Musicians have been the principal resource for generations. Originally published in 1878 as a four-volume set, edited by Sir George Grove (but without his name in the title), the Grove took a huge leap with its sixth edition, which was so thoroughly revamped that when it appeared in 1980, “New” was added to the title. 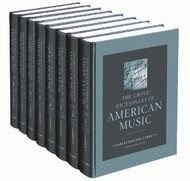 The current New Grove Dictionary of Music and Musicians, published in 2001, fills 29 volumes. The New Grove has spawned several spinoffs as well, one of which – The Grove Dictionary of American Music – is about to get a significant makeover. When it was first published in 1986, the AmeriGrove, as its users call it, filled four volumes, with 2,632 pages, and cost $495. It was considered comprehensive in its day, although some critics argued that it pushed too far into the world of popular culture. A new edition, to be published by Oxford University Press on Dec. 2, doubles that: it will be in eight volumes, with 5,592 pages. Of the more than 9,300 articles, more than 4,800 are new. Over 1,500 authors contributed. It will cost $1,195. The editor of the new edition, Charles Hiroshi Garrett, is an associate professor of musicology at the University of Michigan School of Music, Theater and Dance, and the author of the 2008 book “Struggling to Define a Nation: American Music and the Twentieth Century” (University of California Press). In an interview on the Oxford University Press website, Mr. Garrett said that the new version would take an expanded view of certain American musical forms – country music, for example. To illustrate the scope of the change, he noted that the first edition had about 90 entries about country music. That includes, he said, Latino, Asian-American, Native American, and Hawaiian music and musicians.